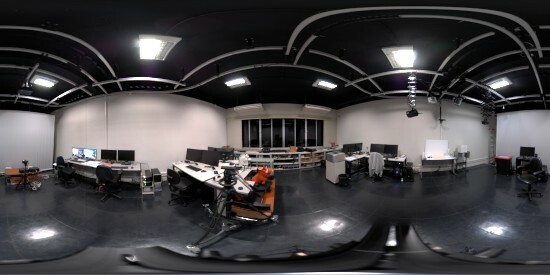 I’m just back from the Siggraph Asia 2012. I was impressed by the people I met, the talks and courses I attended, and why not, the places I visited. Singapore is a very interesting city for a tourist. Among the people I met, a particular meeting was long overdue. I finally had a chance to meet Paul Bourke personally. 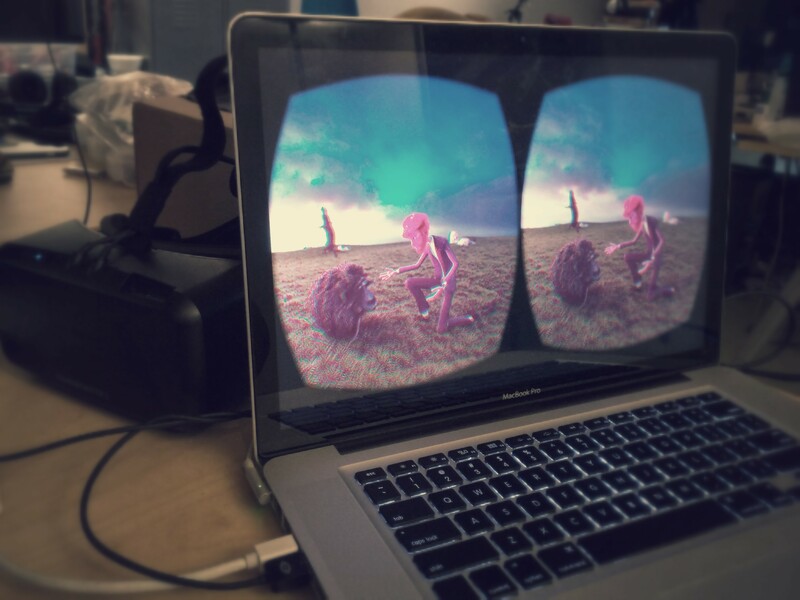 We collaborated (meaning he helped me ;)) in the fisheye implementation for the Blender Game Engine back in 2009. Since then there is not a fisheye related question that I don’t bounce by him first. 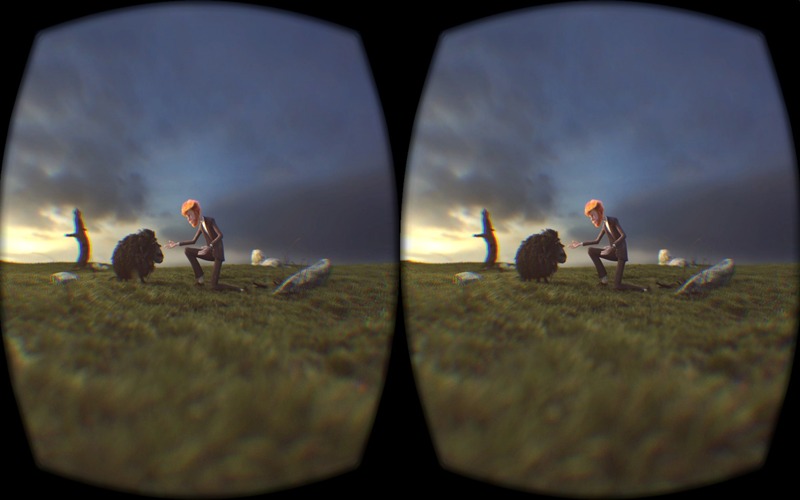 So, in between talks he kindly shared his thoughts for stereoscopic rendering for domes. It took me a week to work around the problem, but here you can see the first real renders in a patched Blender with Cycles. The formula is very simple, it’s just one of those problems that is really hard to debug (at least when you don’t have a dome with 3d projectors at hand). Thankfully in my flight back I had the peace of mind to wrap that up. Today was a meditative day to once again celebrate the passage of our Sun across the exactly-ish point in the sky. Yup, I’m getting old, but hey don’t we all? As my self-birthday gift I decided to face the hills from home to work with my laptop in the backpack (big thing for me, I would always take the bus when I need the laptop, which means almost everyday). To make the self-celebration even more complete, I decided to not only work around my physical healthy, but also to give my mind some food for thought. In the past week, professor Adriano Oliveira was troubleshooting the cycles fisheye camera for his fulldome audiovisual work. 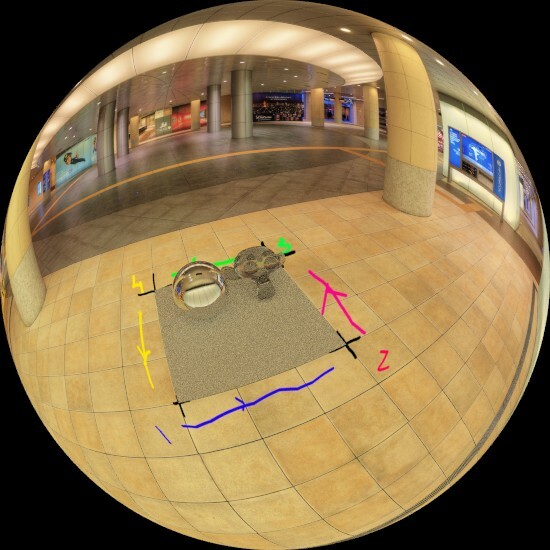 He noticed that the equidistant lens was far off the expected (for example, compare it with the BGE fisheye lens) and even the equisolid (which is great to simulate real fisheye lens (like Nikkon, Canon, …) wasn’t producing a perfect fisheye. Now, something nice … I met prof. Adriano last year in the BlenderPRO (Brazilian Blender Conference). He may have exaggerated, but he told me that the main reason he went to the BlenderPRO was to meet me. It seems that it definitely paid off. I’m not saying I wouldn’t fix this bug if someone else had reported it. But it’s much more interesting to work with someone you met. And why am I saying that? 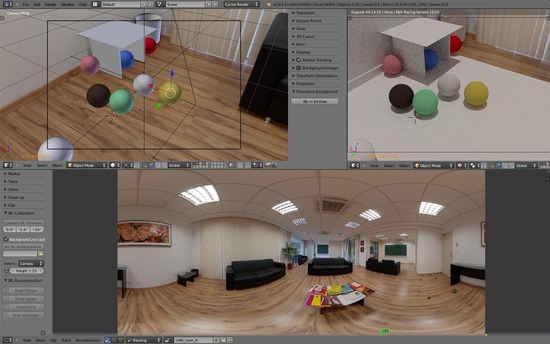 Well, next week we have a new edition of the BlenderPRO. So if you can make to Brasilia, don’t think twice. It’s going to be an amazing event, and I hope to see you there. Wait, what is Suzanne doing there? Ok, that’s not really his original capture. 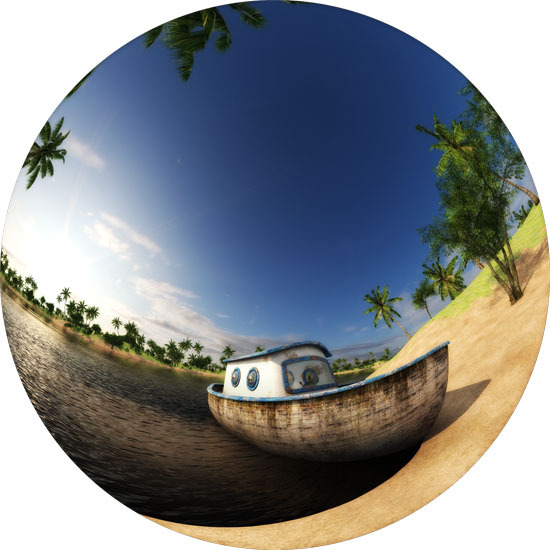 I wanted to explore how would be to insert virtual elements in a fisheye image. It shouldn’t be much different than integrating synthetic elements in a panorama (topic of some previous blog entries and a paper waiting for approval 😉 – more on that later this year ). And as it turned out, it’s ‘straightforward’-ish enough. 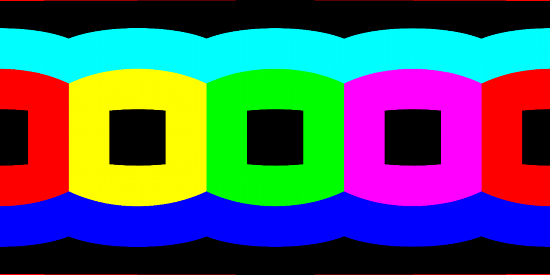 This is a cropped image, expanded vertically to fill the 180 FOV (field of view). 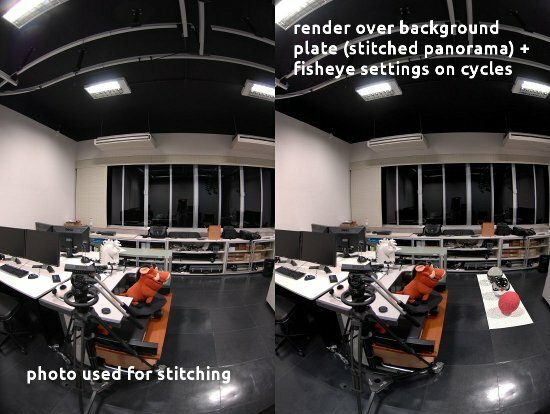 This arrange of camera+lens+4k doesn’t give you a full frame fisheye nor a circular fisheye. 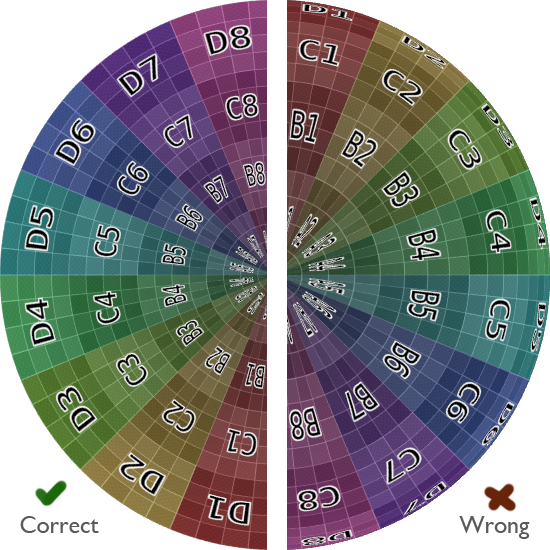 As a curiosity, the Red Scarlet can get a complete 180 fisheye circle if the photo is made in 5k. However you can’t get a 30fps movie capture at that resolution. 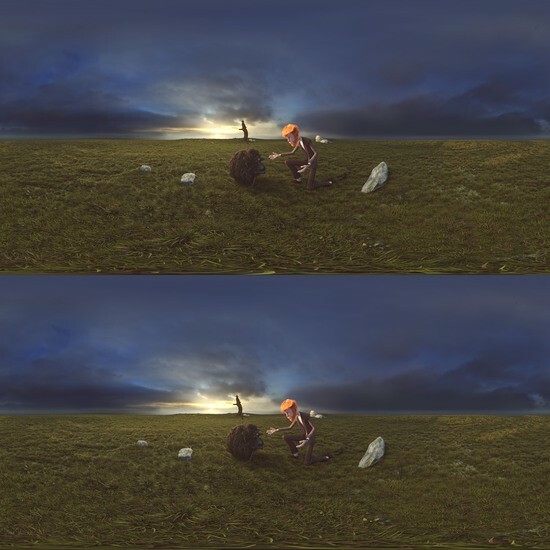 In order to use the IBL Toolkit for the scene reconstruction I first generated a full panorama (360×180) out of the original fisheye photo. 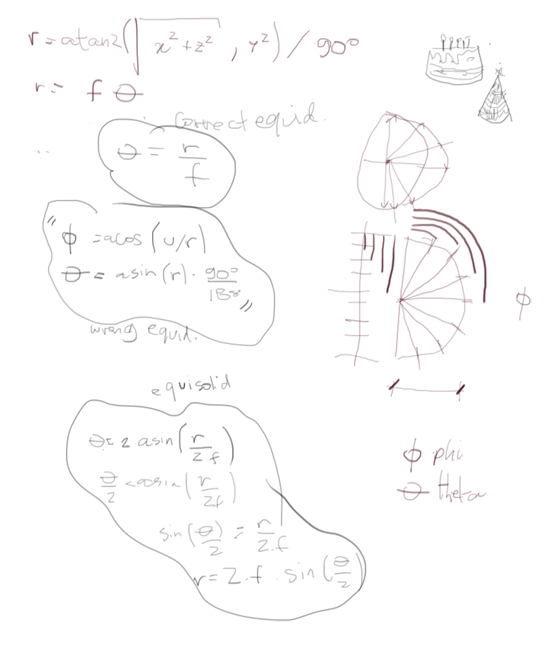 I used the open source tool Hugin for that. 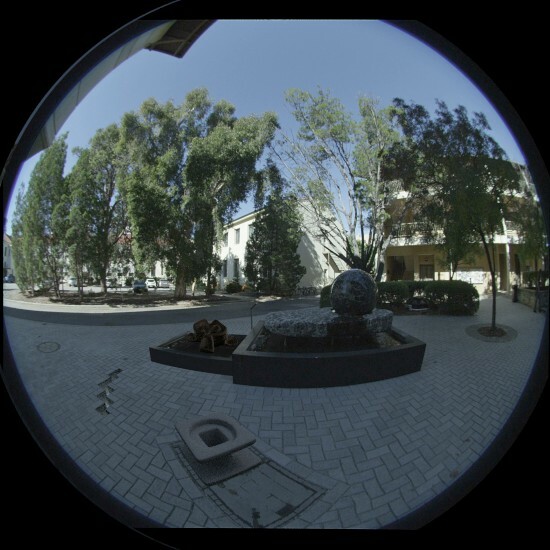 Be aware that Hugin has a bug in the calculation of the focal length multiplier for equisolid fisheye lens (basically it’s using the full frame fisheye calculation for all its fisheye modes). 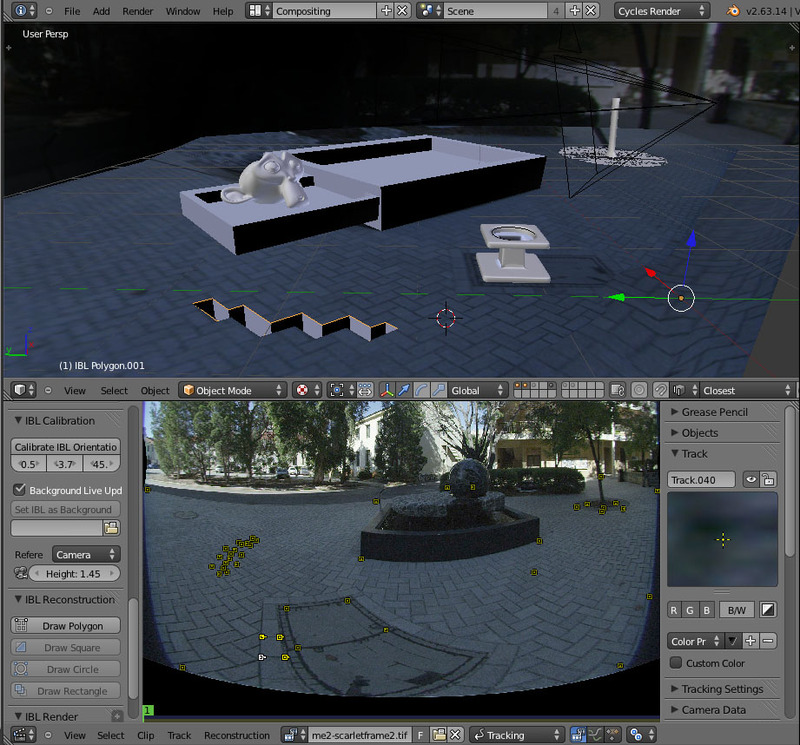 Actually if you know someone involved in Hugin/Panotools project, I would send her/him over this patch. As far as I can tell the fix is along these lines. 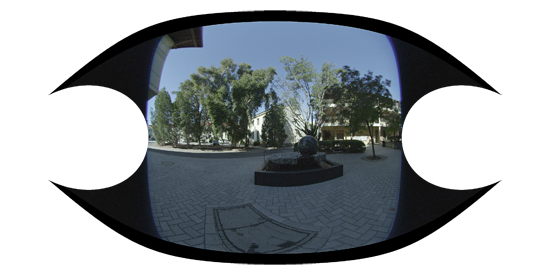 I couldn’t manage to compile Hugin though, so I don’t feel like sending a not-working patch for their tracker. Once I got the full panorama the rest of a piece of cake. 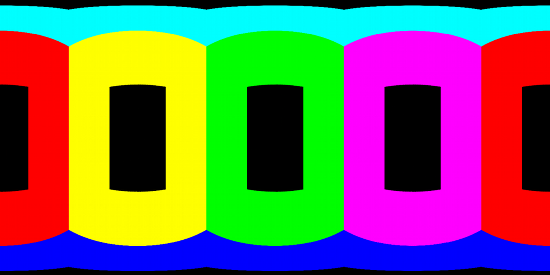 This scene is perfect for the IBL Toolkit (this square in the front plane is practically screaming “Calibrate with me !!11!!”). And a render from a different angle (where glitches are expected). I used the Project UV option of IBL Toolkit to project the corresponding UV in the panorama to the subdivided meshes. I really wish Blender had a shadow-only shader to help integrate support meshes, synthetic elements and a background plate. I’m pretty sure Blender Institute crew worked nicely around that for the Tears of Steel project. I’m still waiting for them to finish the movie and release the files though. The lighting is indeed bad here because the original plate was a LDR, not an HDR, so I didn’t have the lighting of the scene (and didn’t want to bother recreating it – thus you see no shadow in the original scene support elements). 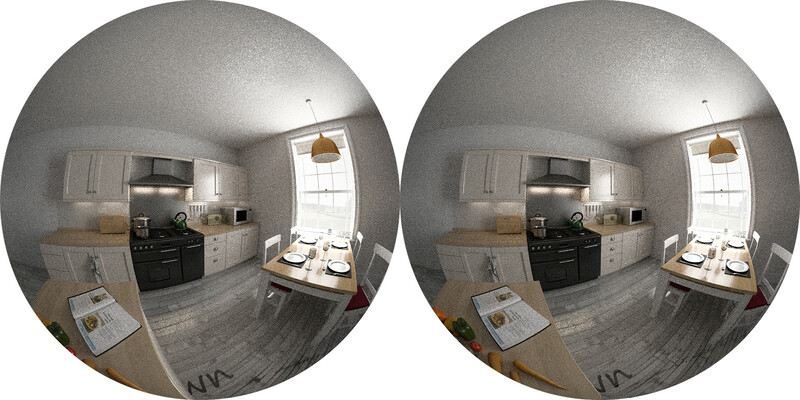 I forgot to say that the final render was only possible due to the Fisheye Lens in Cycles, a patch that I wrote on top of Brecht’s original full panorama code and is already on trunk (and will be available in Blender 2.64). In fact I’m sure I could have fisheye implemented as an input option for the IBL Toolkit (discarding the need of Hugin). That would help to output the content in the exactly same position as the original camera (if you put them side-by-side you can see they have a slightly different orintation). 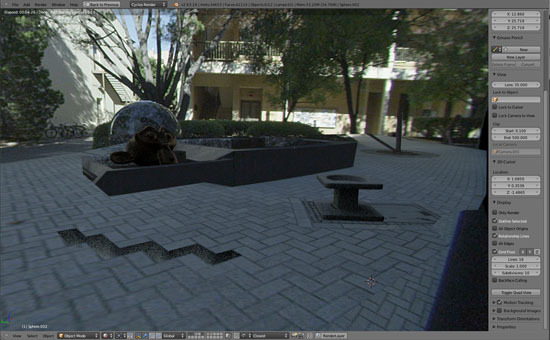 I’m writing an addon to help with scene reconstruction and lighting with IBL files. 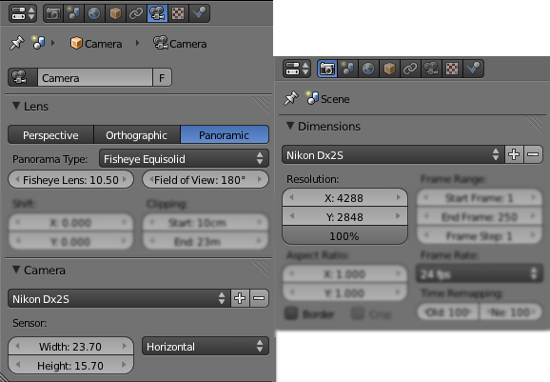 It also works as a handy workflow to expand panoramas with rendered elements. It’s still in its Beta version and I’m evaluating it in production only now, so things will likely change. Note: my goal is to use arluxrender as the final renderer, but all the modelling and editing is to be done inside Blender. For further discussions you can visit the Blender Artists forum thread as well. If you do some real testing with it, please let me know your thoughts. Not only of domes can an artist leave of. The fisheye mode shown in the previous post is sufficient for planetarium productions, but may not satisfy artists looking for ‘real’ fisheye lens. 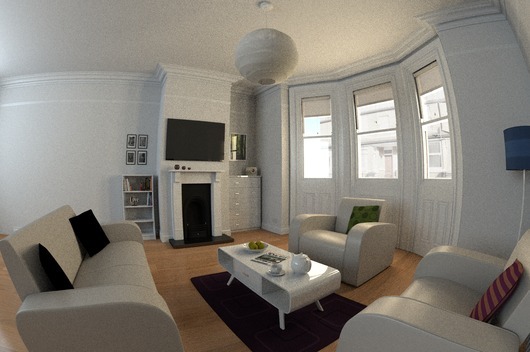 The most common lens found in today’s market are ‘equisolid’ lens (ref: HDRI for CGI). It’s “easy” to put up a nice artistic effect together and simply assume everything is working as it should. 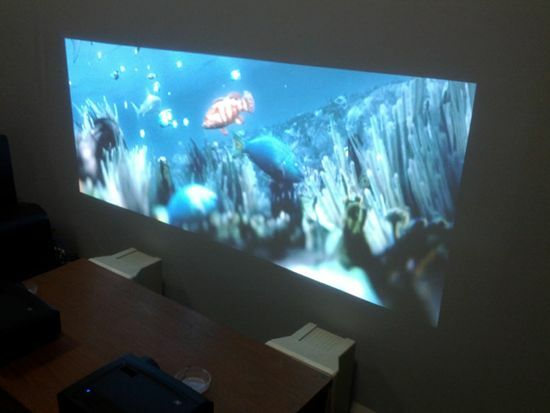 However, I wanted to make a system that could match the effect produced by real lens. For that I had to build a fail proof experiment. People not into coding may not know, but building a reliable testing and debugging setup is one of the keys for efficient coding. In my opinion it’s always worthy to put time into this. Note: this is also why Blender users can help a lot with bug fixing by simply building proper test files for the (also carefully/methodologically) reported bugs). 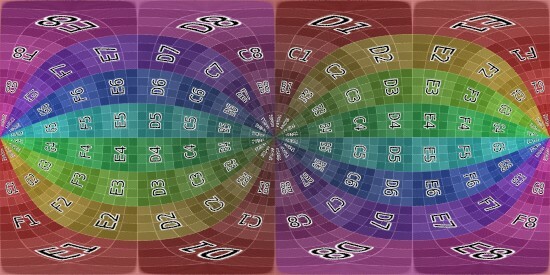 Take some pictures with a tripod rotating the camera on its center (the focal centre actually). We have been doing this for the past two weeks so it was smooth. Those pictures were taken by Aldo Zang in the Visgraf Lab at IMPA. 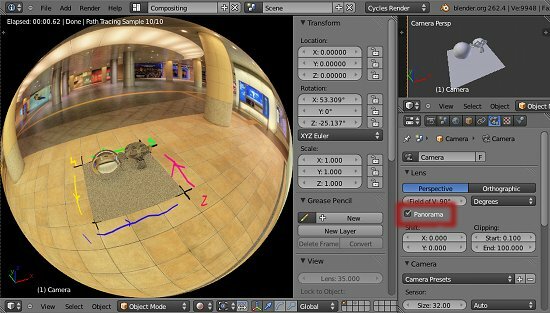 I don’t get tired of recommending Hugin for stitching and panorama making – hugin.sourceforge.net. 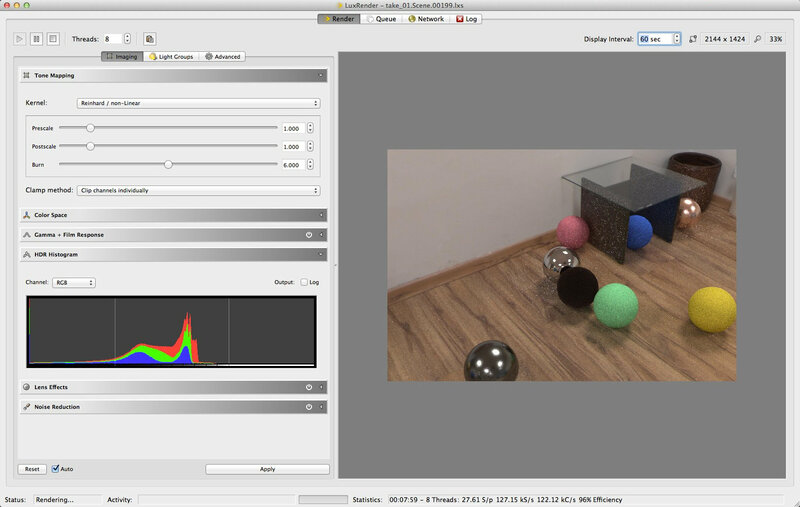 This open source project sometimes works better even than autopano pro (a pretty good commercial alternative). I put the panorama as a background plate, calibrated the aligment, added a simple floor + spheres. 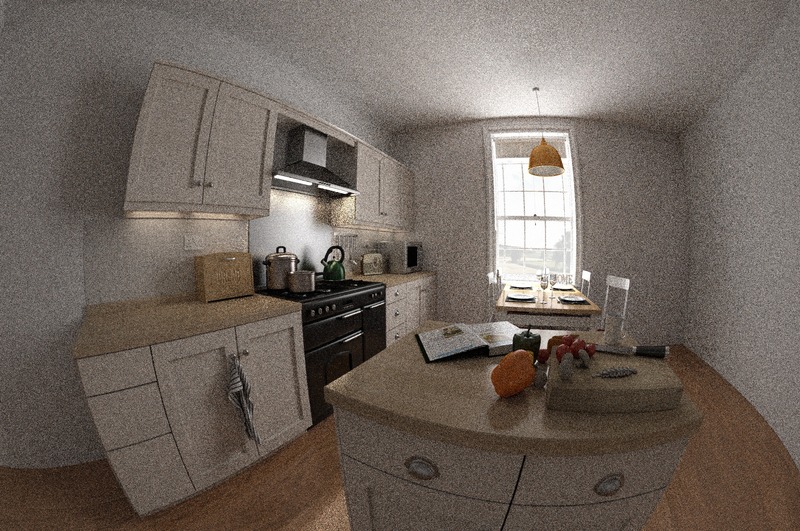 This was done with the (yet to be released) IBL Toolkit. Apart from that my Blender camera needs to match the settings of the real camera+lens I’m aiming at. In this case all the pictures for the stitching were taken with a Nikon DX2S and a fisheye 10.5mm lens. 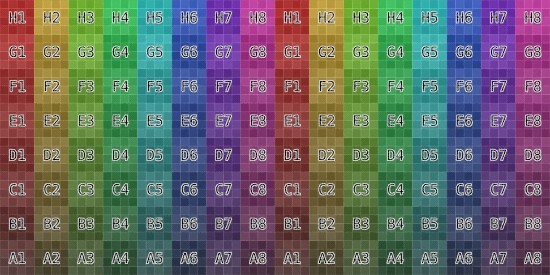 I created new presets for the sensor dimensions and the render output. Also note the bottom left corner of the photo. This subtle shadowing is due to the vignetting of the lens. 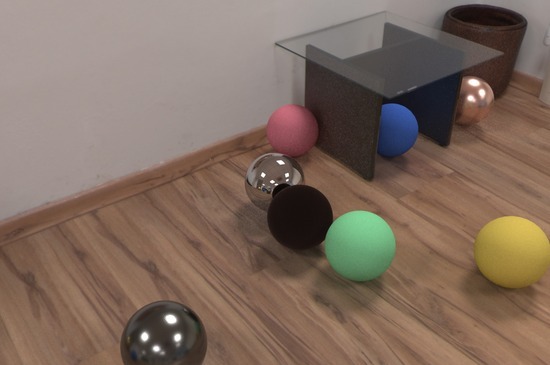 This is not present in the cycles render because I’m not implementing a real camera model (as shown here and here). I hope you like it. If you can share any work you did with this feature I would love to see it. Fisheye in Cycles, yes we can ! 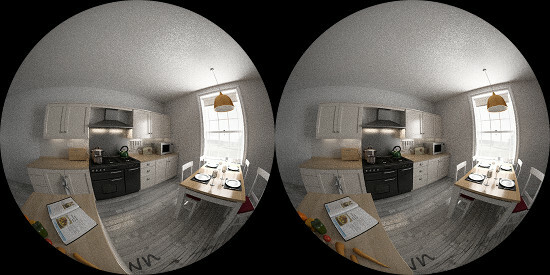 What if we could render fisheye images directly from Blender? 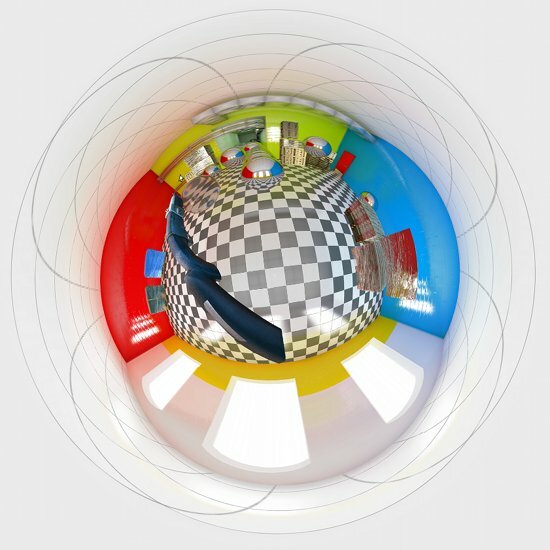 Yesterday I found out about the Equirectangular mode in Cycles. It got me quite thrilled (it’s been awhile since I was waiting for that). What comes next? I will talk with Brecht to see if there is any pending design to have this implemented as another camera option. 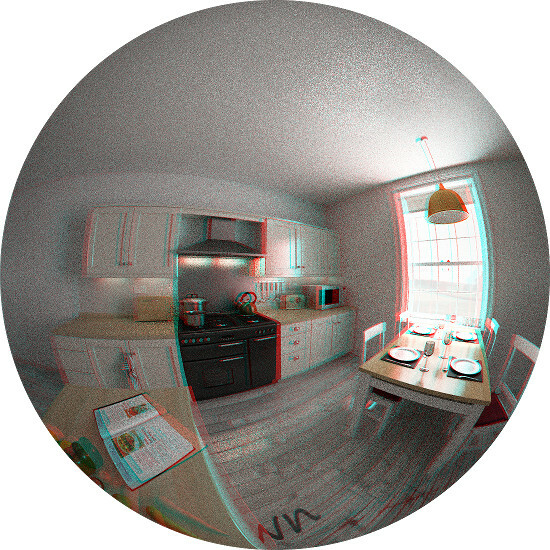 I would like to have an option to set the angle (so we don’t need to do only 180 degrees fisheyes). And to toggle between hemispherical and angular fisheye modes. * IBL Toolkit explained here. 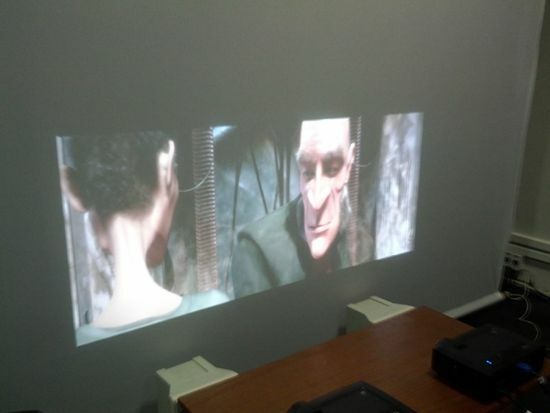 What do you do when you have 2 idle projectors by your computer? The answer is obviously a high definition projection area to be filled with lo.v.e. (lots of valuable experiments). I’ve been following the work of the Vision3D since 2009. 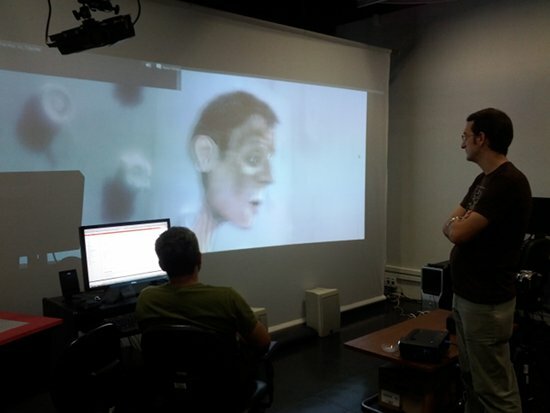 This lab in Montreal is specialized in computer vision (recherche fondamentale et appliquée sur les aspects tridimensionnels de la vision par ordinateur). Lead by Sébastien Roy they have been producing (and sharing!) 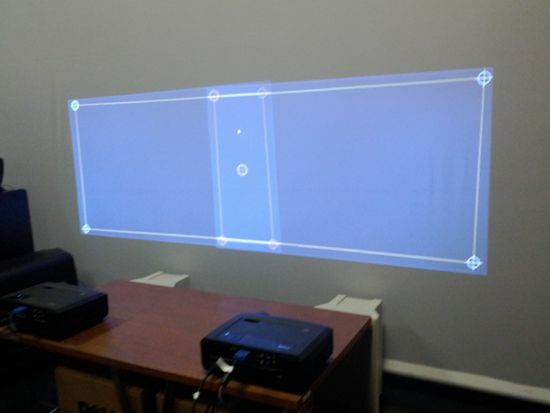 on calibration of projection surface (e.g. 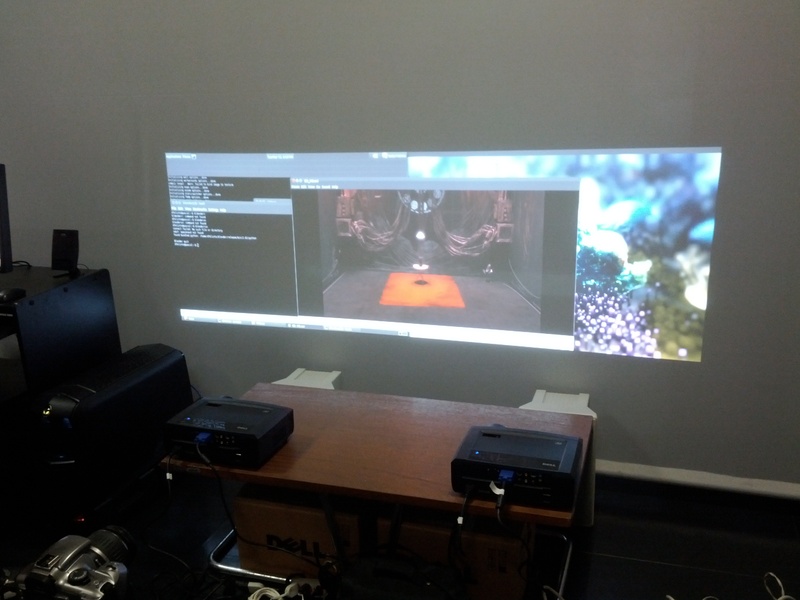 domes o/), multiple projector systems, and content toolsets. The Vision3D lab main tool in that area is Light Twist. This tool was presented in the LGM2009 with a live showcase of the system in a cylinder. In the last week I tried to have light twist going with a multi projector system (aiming to use this for a dome later on) but so far I’m stuck in the playback of content (and I suspect the calibration stage is wrong). Anyways, light twist will be a topic of another post, once I get it up and running. 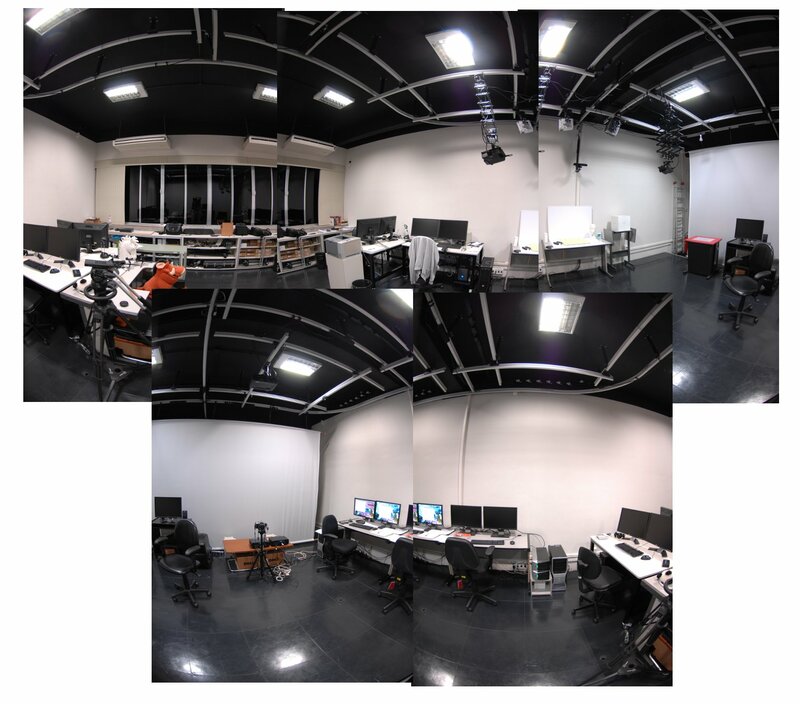 Since 2009 the light twist project shifted its focus from labs to end users. 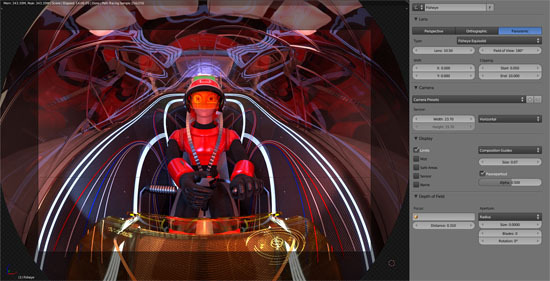 In 2011 they finally presented a new project called lt-align and lt-compiz-plugin. The lt-align is a software to quickly calibrate the screens alignment, very easy to use. The Compiz plugin requires some fooling around with ubuntu settings, but once things are in place it works like a charm. I’m yet to make it work with Unity, so I can have real fullscreen across the desktops. Note: there is an extra package you need to compile the lt-compiz-plugin:`sudo apt-get install compiz-plugins-main-dev. And I didn’t have to restart compiz with ccp to make it work. Also I changed the shortcuts to start the plugin because Alt+F* were taken by other OS commands. In this picture you can see Djalma Lucio, sys admin that oversees all the computer installations at Visgraf on IMPA. A great professional and a very funny guy to work with. Think about someone that actually enjoys opening a xorg.conf file. And you can also see in the right Aldo Zang. Check it out his ARLuxRender project – a plugin system for LuxRender “which allows to render scenes with mixtures of real and virtual objects directly, without post-processing”. I hope to post more in the coming months in domes, projections, a special video project … 😉 I went on a 3-month leave of my work at UBC to join the research lab at Visgraf/IMPA, under the coordination of prof. Luiz Velho. This is the second week only, but it’s been already a great experience. And above all, it’s nice to be back home (Rio de Janeiro, Brazil).